We have many projects where we need your help on the field at each location for a short period of time. The type of work varies from project to project. 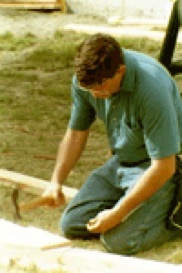 One project may require tile floors; wood or sheet rock walls and ceilings; plastering walls; block laying; lighting; electrical; building shelving, tables, desks or computer stations. Another project may require inventory of an existing library, entering data into the database, repairing books, labeling book spines with Dewey decimal system. Some require both construction and non construction work. We can fit your skills with the right project. Please let us know if you are interested.